The sail up from Shipwreck Bay to Cephalonia was actually a sail at times, as the wind was on the beam for a change. Still had to motor at times as the wind varied from 30kts down to zero. We were aiming for Sami but changed our minds halfway across and decided to go into Agios Eufimia as it looked prettier and was closer to the underground cave, according to Rod. 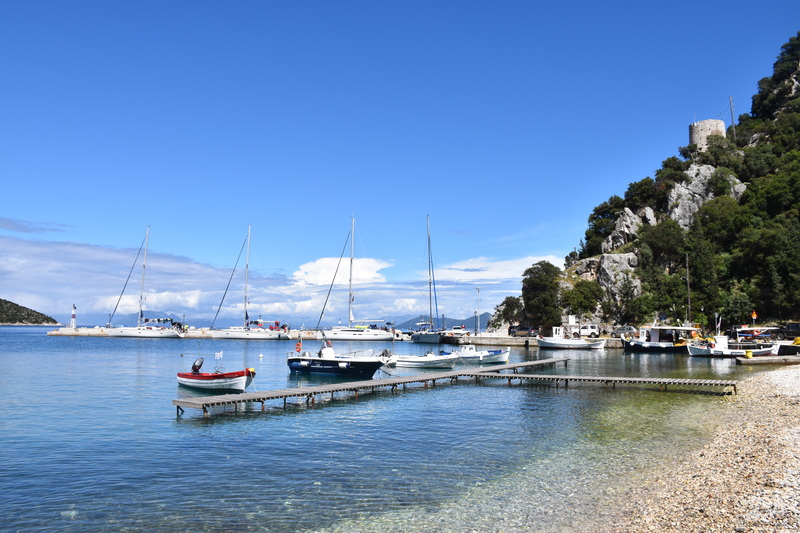 It was a good choice as the harbour had just received a facelift with a nice new wall and power and water facilities – plus a welcome sailors life-ring. Nice touch. We were happy about the water as our water pump had developed a leak; still useable but you needed to turn it off and on at the panel every time we wanted to use water. At the dock, we could simply plug in the shore water and use its pressure to supply the boat, completely bypassing our faulty water pump. It was Easter Sunday and Roast Lamb is the traditional meal for the Greeks. We decided the restaurant straight over the road was as good as any, with the added advantage we could pinch their Wifi password for our Badboy wifi extender on board. And it was raining so no need to get wet walking far in the rain. We’d spied an Australian Flag on a Canadian cat up the wall so we said hello and decided we could all rent a car the next day to see the island. 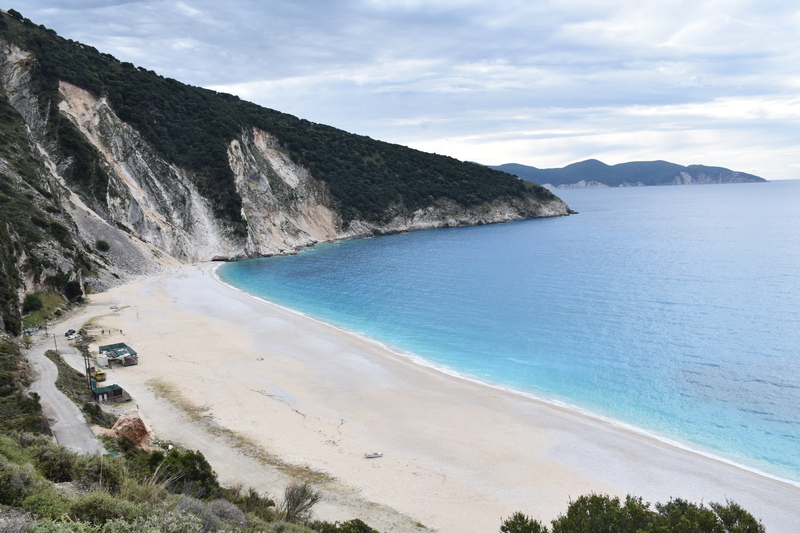 Just as well as Rental Cars were expensive on Cephalonia – 71 euros it cost us. So off we went, next morning, Rita, Sten, Chris, Dee and I, heading for Lake Melissani. Using Google Maps, we sort of found where the underground lake should be – that was if the one and only road that goes to it hadn’t had a great trench dug through it. We got out and found we were in the mist of a bit of a neighborhood tiff. The police arrived and told us there was a hole in the road – really. Anyway we pressed on on foot, clambering down and up the hole and made it to the grotto, which remarkably was open in all this kerfuffle. You get to the Lake through a tunnel that someone has carved out and then a boatman picks you up and takes you on a short tour underground. The lake is quite beautiful and the interesting thing about it is that it’s fed by the sea that gets forced through some fissures across the mountains on the other side of the island, travelling the whole width of the island, through the cave and into the sea on the other side. Quite remarkable. Never heard of anything like it. Next stop was the Cave of Drogarati, which was worth a stop, before we headed inland to the wine growing district, for a bit of wine tasting and stocking up. Then it was onto Argostoli for lunch and then a drive along the Western coast to check out some nice beaches there. We end up at Assos (jokes aside), which is on this amazing headland with a really cool Venetian Fort at the top. And when I say top, I’m talking “26 switch backs walking up to it” up. Having got our quotient of exercise for the day, we headed down the 26 switchbacks and then drove back to La Mischief, where a few glasses of wine were consumed over a few charts as we explained some of our highlights and where we had been. Next morning, we headed off for Fiskardho, a cutesy little harbour, that somehow managed to escape being flattened by the 1953 earthquake that completely flattened the rest of the island. Unfortunately it was a really cutesy little harbour that everyone else had heard about, and with the flotilla season just starting, it had its Sorry We Are Full” sign out. The good thing about the Greek Islands is that there is ALWAYS somewhere else good to go. In this case it was on Ithaca, the neighboring island. I’d stopped in their briefly on my way across to the Corinth Canal in 2013 so now I’d effectively completed my circumnavigation of Greek. Back in familiar waters. 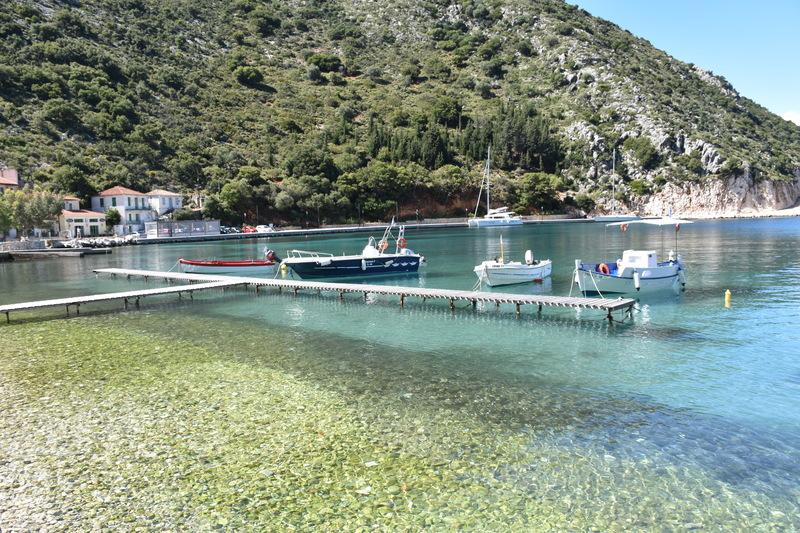 This time, we headed for Frikes, a cute little port with 5 other boats. It was a tiny town with beautiful, beautiful water and a free dock. It had been stormy and overcast as we came across but the skies cleared leaving a beautiful day. We took a walk up the hill to a town called Stavros and called into a Homer’s Ulysses museum, Ithaca is supposedly the island of Ulysses from 800BC, but it’s evidently still open to debate. We just stayed a night and in the morning we headed off to Meganisi – the Rorschach Inkblot Island. This entry was posted in Greece and tagged Agios Eufimia, assos, Cephalonia, Fiskardho, frikes, Ithaca, Lake Melissani by stull61. Bookmark the permalink.